If spring has been reluctant to show its face up until now, we have some news that might just coax it out from wherever the hell its been hiding. Check out The Prince, West Brompton’s pub-food-hall hybrid complete with four restaurants, three different bars and what owners are claiming to be London’s largest beer garden. 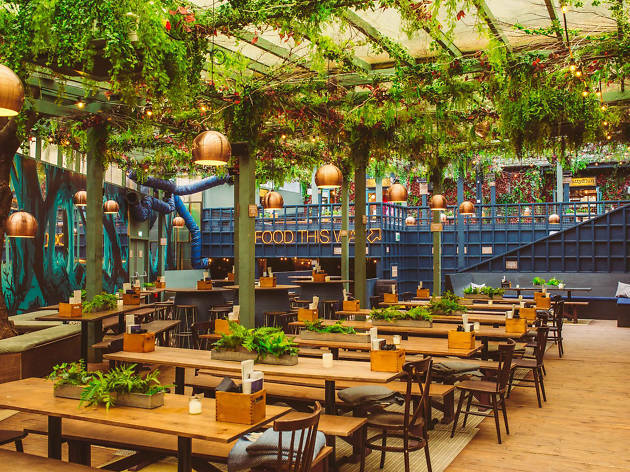 It’s just flung open its doors for the spring and summer ahead, and the beer garden has been given the look of a magic English summer garden, decked in wisteria and hydrangeas. And just in case the English side of things proves to be more true than most would appreciate, the garden has a retractable roof to help protect against the elements. The garden is a little hidden away at the back of the pub, but we’re sure this whopping space won’t be kept a secret for much longer at all. Here’s its beautiful evening guise, which looks pretty party-ready to us. To celebrate the re-launch, The Prince is offering a free frozen margarita for each visitor, which can be claimed by filling out a form on the venue’s website. Yep, free tequila is that simple. And with street food available from Patty & Bun, Coqfighter, Begging Bowl and Foley’s, that booze shouldn’t go to your knees too swiftly. Meaning you can while away those long summer days in the sun for even longer. Yeah, right. See you under that retractable roof! The Prince is at 14 Lillie Road, SW6 1TT, open seven days a week (come rain or shine!). Get a free margarita at The Prince by signing up on the website. Find more great places to drink outdoors in our guide to London’s best beer gardens.